Indiana University preserves its green spaces, and as a result parking is limited on campus. 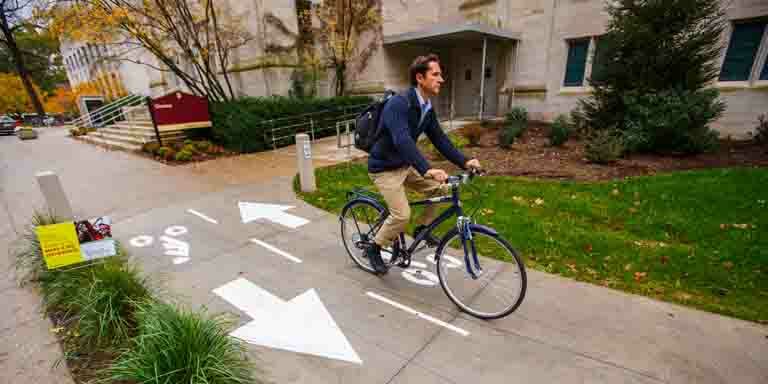 IU students manage very well without cars—most walk, bike, or ride the bus to campus. You'll find many safe and easy ways to get around. The IU Office of Sustainability is dedicated to reducing car traffic and emissions. You can partipate by adopting green modes of travel and getting involved with sustainable transportation projects. Take care of yourself and take advantage of free safe ride services that run after dark. Learn about parking and traveling to and from campus. The IU Campus Bus Service provides routes that serve all parts of campus. Rides are free for IU students. The campus fleet is fully accessible—all buses are equipped with a kneeling feature and a wheelchair ramp. You can track the buses in real time. IU students, staff, and faculty ride for free on Bloomington Transit, our city bus system. The buses offer routes to and from campus, and around Bloomington. To say we are a bike-loving community is an understatement. Biking is nearly a religion at IU, and we have the world’s greatest college bicycle race—the Little 500—to prove it. It’s also our favorite green way to get where we’re going. Bloomington is small enough that you won’t break the bank taking the occasional taxi from any point A to any point B. And you can always share rides with friends for a less expensive, greener option. Shuttle services can take you to and from the Indianapolis International Airport, a 50-mile drive from campus. Go Express Travel also runs between the IU Bloomington and IUPUI campuses. A safe and convenient option for IU students who hail from Chicago, South Bend or northwestern Indiana, this service is available during holidays, IU breaks, and select weekends. If you must drive to campus often, you’ll want to get a parking permit. There is no free parking on or near campus, and at peak times of the day and year, be prepared to hunt for the closest spaces. Don’t gamble—you will be ticketed for parking in an IU lot without a parking permit. The City of Bloomington will also ticket you for not paying the meters on city streets near campus, unless you have a city parking permit. Learn more about your parking permit options. If you’re parked in an IU lot and your battery dies, you lock your keys in your car, or you get a flat tire, the IU Motorist Assistance Program is here to help. Call 812-855-9849 from 6 a.m. to 10 p.m., Monday through Friday.